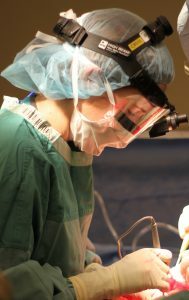 Dr. Andrea MacNeill, a surgeon at Vancouver General Hospital and Clinical Associate Professor with the UBC Department of Surgery, recently analyzed the carbon footprint the carbon footprint of surgical suites at three hospitals in Canada (Vancouver General Hospital), the United States, and the UK. The findings were recently published in the Lancet. She found the choice of anaesthetic gases used in surgery can be a major contributor to greenhouse gas emissions from operating rooms but that it’s possible to reduce emissions in health care settings. Researchers measured the direct emissions, (gases), indirect emissions (electricity) and other emissions (surgical waste) according to the Greenhouse Gas Protocol.